Hi everybody! Its been over a year since the last art-a-thon as we have all been very busy. 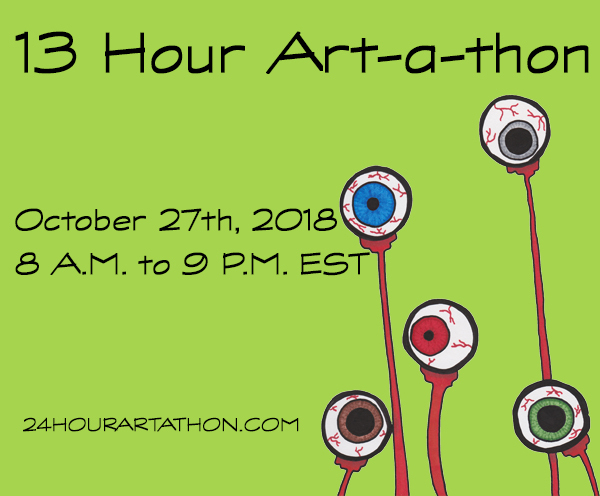 I however decided to take a break from painting and doing updates on my new home to host a 13 Hour Art-a-thon on Saturday, October 27th from 8 A.M. to 9 P.M. Eastern. The art-a-thon will be Halloween themed. There will be prompts every 2 hours and there will be a prize at the end of the art-a-thon. As with all our art-a-thons, all are welcomed to participate. To participate in the art-a-thon we recommend you join our Facebook group as that is where most of the interactions take place. If you prefer using Instagram I have created an account for the art-a-thon. You can follow us by clicking here. Meet Trisha Doran, the third guest host for the upcoming 12 Hour Art-a-thon that will be held on the 14th of January. Below is a quick interview to help you get to know her better. Melissa – Tell us a little bit about yourself. 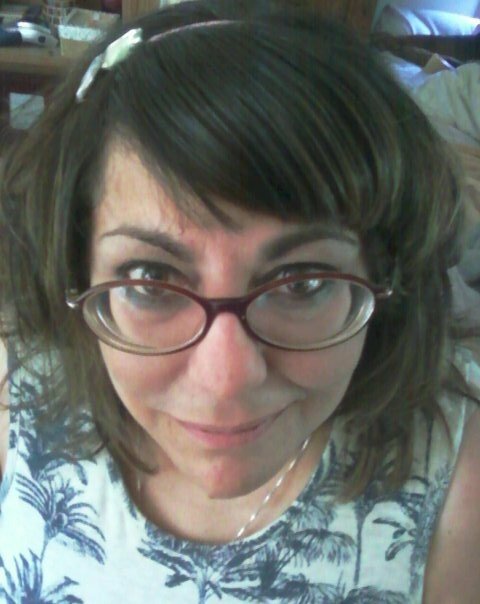 Trisha D. – I live in Independence, Missouri with my 4 dogs, Zeke, Luna, Lily & Bandit. They are my great joy and besides reading and playing online games, political fighting on facebook and art, I have no other hobbies, really. I like to cook and I’m great at it, but I never clean, ever. I’ve finally rectified that issue by hiring it done, so it’s not such a smelly dog, artsy mess. I also curse a lot, even when others would find it unnecessary. Melissa – What kinds of art do you do? Which is your favorite? Melissa – What inspires your art? Melissa – Tell us about your work space. 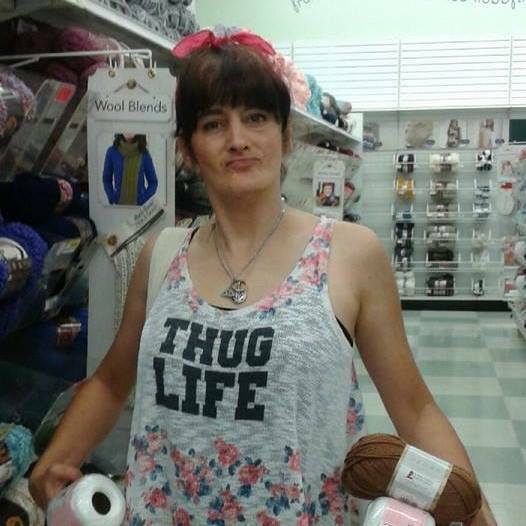 Trisha D. – Uggh! Actually, I’ve been on a year-long quest to organize it. For people who know me slightly, they would be surprised to know that it’s very girly – now the room is painted pink and I have a pink chandelier (squeeee!). I’m a closet girly-girl. It makes me happy, and that’s all that matters. I’m also a horrible slob, so time shall tell if it will stay pretty. Melissa – What are some of your favorite mediums to work with? Trisha D. – Water-soluble anything – that really trips my trigger. Sprays and stencils – fun! Glitter of course, if that’s a medium LOL. Ink. Mostly anything messy and drippy and I’m there. 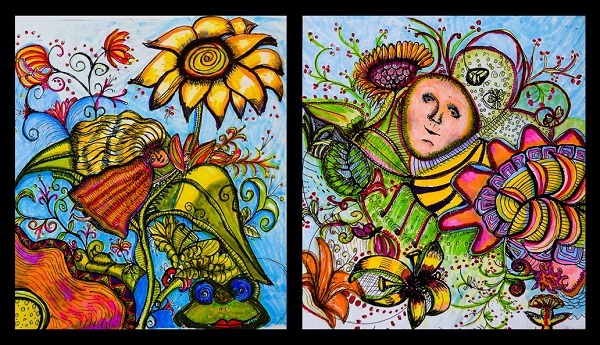 More examples of Trisha’s art. Melissa – Are there colors you favor in your art? If so what are those colors? Trisha D. – I like what I call mermaid colors – aqua, turquoise, emerald green, violet, dark blue, etc. Melissa – Is there any art technique, supply or medium you would like to try? Trisha D. – Gelli plate! Melissa – When being creative what is one thing you must have? Trisha D. – A pen. Melissa – Who is your favorite living artist? Who is your favorite deceased artist? Why are they your favorite? Trisha D. – Jeez, this is hard. Living artists are mostly people I “know” on the internet and am friends with on Facebook. Effy Wild, Sarah Trump, Nika, Tamara LaPorte. Dead artists? Renoir, Degas and Monet all trip my trigger. I love the ethereal beauty they portray. I’m also one of the few who can’t stand Frida Kahlo – yeah, I said it. it’s true. Melissa – What is your favorite work of art? Meet Trisha Fettig, your second guest host for the upcoming 12 Hour Art-a-thon that will be held on the 14th of January. Below is a quick interview to help you get to know her better. Trisha F. – I was hatched from an alien egg left on my parents doorstep in Hollis, Queens, NY in 1969. Okay, I was really hatched in a human incubator and adopted by them, but grew up wishing and hoping that my real biological parents were Cher and Sasquatch. I was lucky enough to have a father who encouraged every single one of my passions and would give me giant color books that were 3′ tall and blueprints from his job as a rebar detailer to use as art paper. So I am probably one of the only people who has had the opportunity to draw massive stick figures on the back of the plans for the Twin Towers, the Verazanno Narrows Bridge and Yankee Stadium. As a grown up, Okay, I’m not really grown up, I’m just tall for my age, I live in Western New York, and I bowl. It’s the only hobby I have time for currently, because I am always crocheting something for my business, Yankee Rose Creations. Trisha F. – I crochet, and crochet some more, and then I crochet for fun. 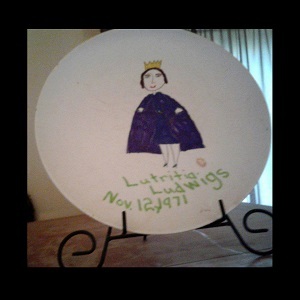 But I also paint, sew, quilt, and really like to do anything creative. My favorite is probably painting. Especially 3D painting of sculptures and ceramics, but I don’t do it enough. Trisha F. – People inspire my art. The majority of the things that I make have all been requests from one person or another. I actually just got a request for a bunch of Sasquatch dolls for a baby mobile. I literally squealed! Trisha F. – My workspace is an absolute disaster area right now, and I am surprised that Sarah Trumpp has not beaten me over head with one of her sculptures or copper wands lately! I am lucky enough to be able to have a large space in her studio, which I have been neglecting lately trying to fill orders and get inventory made for shows. I will probably be spending my Christmas there reorganizing the piles of fabric, papers, yarn and books that are all over right now. Trisha F. – Since most of the art I am doing right now is fiber art, I have to say I love hand dyed wool, and alpaca is just pure heaven. I am trying to learn how to sculpt, and I really do enjoy working with clay. 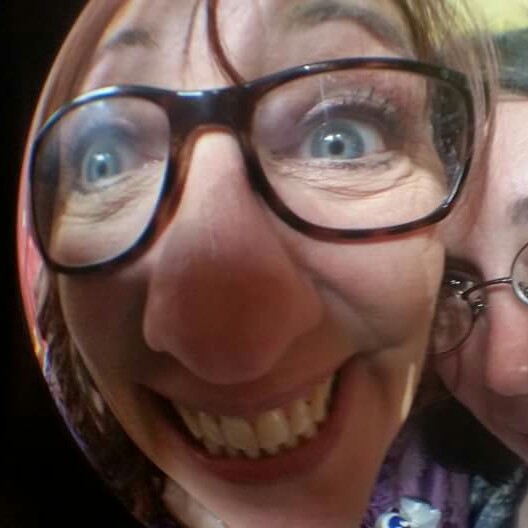 Trisha F. – Pottery! I want to learn how to throw clay. I mean, I can throw it, but clay stuck on the wall like pieces of spaghetti isn’t exactly what I am talking about. And it is kind of messy. It also tends to wreck my whole cobweb interior design look I have going on. Trisha F. – MUSIC! Have to always have the tunes on! Because….dancing! Trisha F. – Living, isn’t really an artist, but a designer. Betsey Johnson. Just love her whole outlook on life. Skulls, and guns and tutus and glitter! And deceased would have to be Charles Schultz. Again, not really an “artist” in the common sense of the word, but what he did with Peanuts is amazing to me. And who doesn’t love Snoopy and Woodstock? Trisha F. – A shamrock that my youngest daughter painted when she was 3 years old and learning about mixing primary colors. You can find Trisha’s crochet creations in her etsy shopYankee Rose Creations. Her creations include amigurumi dolls, hats, baby attire and more. Examples of Trisha’s amigurumi dolls. Meet Amy Anderson one of your guest hosts for the upcoming 12 Hour Art-a-thon that will be held on the 14th of January. Below is a quick interview to help you get to know her better. Amy – I live on the central coast of Oregon, surrounded by forest, ocean, river and bay, so there’s tremendous beauty and inspiration everywhere. My husband, 16 year old son and I live a simple life, attempting to grow, forage, hunt, preserve and process as much of our own food as we can. We love living in Oregon and taking advantage of the natural resources – crabbing, fishing, hiking, mushrooming, beach combing, and enjoying the musical and artistic community in which we live. Amy – For the past 9 years, I’ve primarily worked in soft glass, making beads and fused glass tiles. I’ve had to back off of the torch for health reasons, so I’ve been going back to 2-D art – drawing, painting, etc. Examples of Amy’s glass art. Amy – Nature is a huge inspiration. I am also inspired by life in general – capturing little, everyday moments and finding the magic in them. Amy – It’s generally very messy! I have a drawing/painting station set up in the living room, and a studio that occupies most of our garage. I’m pretty spoiled with the amount of space I have all to myself. In the past, I’ve had as many as 8 glass artists comfortably working in the studio at once, so that gives you an idea. Amy – Glass is my very favorite. I also love pen and ink, watercolor, alcohol ink, ceramics, metal, collage, mosaic, digital art and mixed media. Amy – I use primarily bright, saturated, high-toned colors – what I think of as a New Orleans palette. Examples of Amy’s Alcohol Ink Art. Amy – I want to work with acrylics more. I’ve just barely dabbled in them. I’ve always gravitated toward mediums that highlight the interaction of light through transparent color (glass, watercolor, alcohol ink), but I’d like to work in an opaque medium for a while. Amy – If I’m in pure creativity mode, I like solitude, and sometimes music. If I’m in production mode, I enjoy company and something to distract me, such as audio books. Amy – My previously favorite living artist just died a couple of years ago – George Rodrigue, a South Louisiana artist known for his iconic Blue Dog paintings. He was older than me, but experienced a very similar childhood in South Louisiana, so watching him grow as an artist in our shared culture was inspirational and informative. He also employed a “New Orleans” palette – bright, saturated hues with strong contrasts. Blue Dog evolved into his alter ego in his paintings, so Blue Dog often expressed how the artist felt about a given situation. Cappy Thompson and Dale Chihuly are two living artists I really like – their glass is amazing. Some favorite deceased artists include Picasso, Kandinsky, Albers, Chagall, Van Gogh, Monet, Degas, Munch, Hokusai, Miro, Klimt – basically the artists who worked between the late 1800’s and early 1900’s. That’s the most exciting period of art for me. Amy – I don’t think I could pick one favorite. Right now, I’m in love with Van Gogh’s sunflower paintings and his Ukiyo-e (Japanese wood block prints) inspired work. His painting, “The Courtesan”, for example, was inspired by Japanese Ukiyo-e artist, Keisai Eisen, and incorporates the Japanese aesthetic into his already unique voice. Amy’s art can be found on Som1Store. There you can find, jewelry, clothing and custom knobs. 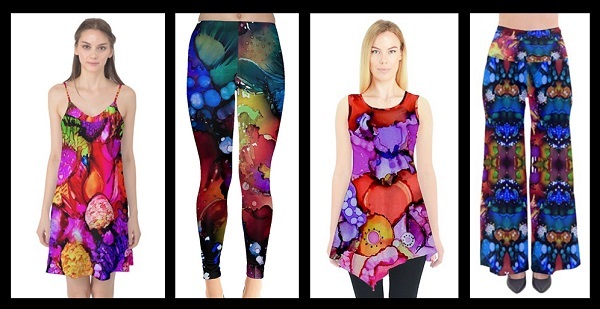 Examples of Amy’s Alcohol Ink Art on clothing. 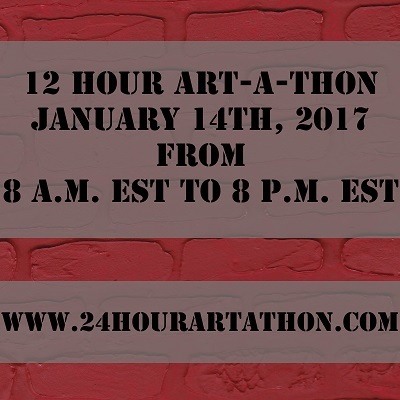 We have decided to host a 12 Hour Art-a-thon on January 14th. 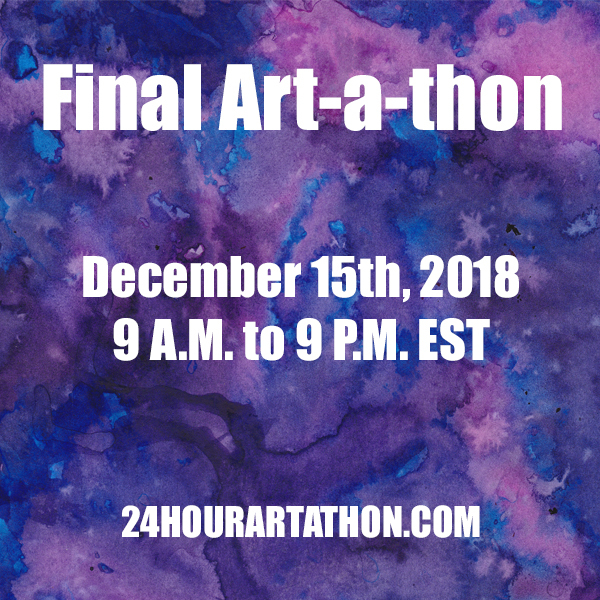 The art-a-thon will begin at 8AM Eastern and end at 8PM Eastern. For this art-a-thon we have decided to have guest hosts as well. There will be 4 guest hosts. As the weeks go by we will be introducing you to each of the guest hosts. This way you will get to know them before the art-athon. As with all our art-a-thons, all are welcomed to participate. To participate in the art-a-thon we recommend you join our Facebook group as that is where all or most of the interactions take place.